In the wake of a trip to Mackinac Island last week, where autumn had taken a firm grip and beauty reigned unabashedly though skies were grey, I had no trouble letting my eyes notice. The above photo collage documents some of the sights my traveling companions and I saw. Even in the slightly gloomy weather of the first day on the island, the bright buildings, glistening boardwalk, coffee shop, private homes, old stone church, and Grand Hotel glowed under dreary skies. The next day, as we were preparing to depart, sunshine heightened color in the harbor, the Iroquois Hotel, and the trees we passed on the drive home. 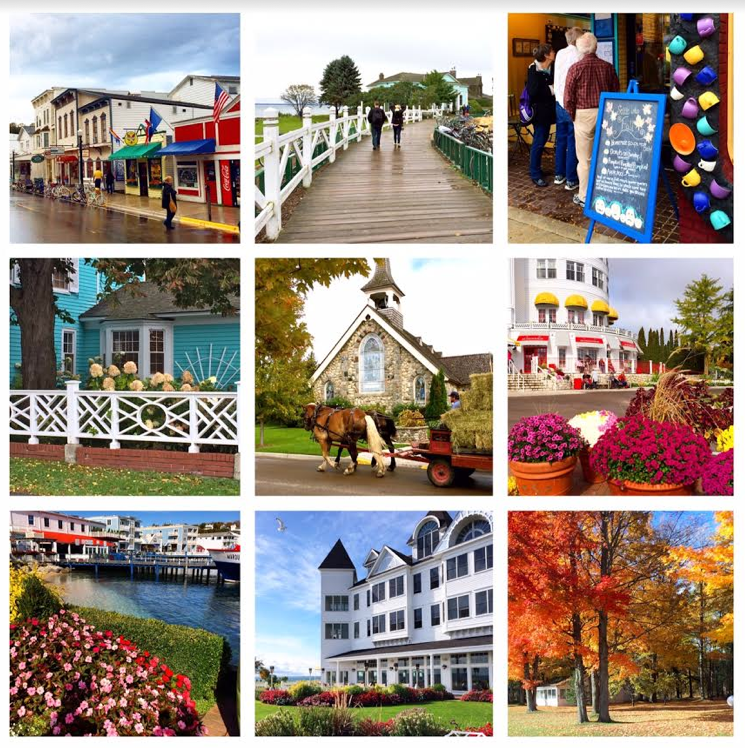 And it wasn’t difficult to bring back memories of the smell of fudge and caramel corn, the sound of horses clip-clopping around the island, the taste of margarita pizza, the feel of cool air blowing off the Straits of Mackinac connecting Lake Huron and Lake Michigan. Before the Mackinac trip, I had stumbled across this Spirituality and Practice feature entitled Falling in Love with a Poem: How to develop a vibrant relationship with a poem, letting it change you. The subject matter, based on a book called Saved by a Poem: The Transformative Power of Words by Kim Rosen, drew my attention immediately and, as the week went by, I was reminded on two occasions of special quotes (though not complete poems) that had been favorites of mine for at least 20 years. A second favorite quote, this one from Frederick Buechner’s Wishful Thinking: A Theological ABC, came to mind in a phone conversation when a friend referenced it: “The place God calls you to is the place where your deep gladness and the world’s deep hunger meet.” I couldn’t help but remember back to the day when I first read that Buechner quote and realized my deep gladness and the world’s deep hunger were calling me, over weeks, months, and even years, to become a spiritual director. May the Dominican blessing lead you this day and week, as well, to "let your eyes 'notice', your taste buds 'savor', your hands 'embrace', your ears 'be attentive', your nose 'inhale' the wonders around you."